Antoni Gaudí i Cornet (25 June 1852 – 10 June 1926) was a Spanish Catalan architect from Reus, who was the figurehead of Catalan Modernism. Gaudí’s works reflect his highly individual and distinctive style and are largely concentrated in Barcelona, notably hismagnum opus, the Sagrada Família. 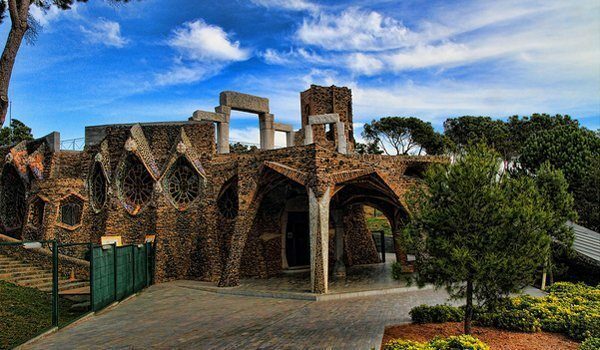 Much of Gaudí’s work was marked by his big passions in life: architecture, nature, religion. Gaudí studied every detail of his creations, integrating into his architecture a series of crafts in which he was skilled: ceramics, stained glass, wrought ironwork forging and carpentry. He introduced new techniques in the treatment of materials, such as trencadís, made of waste ceramic pieces. The salamander in Park Güell has become a symbol of Gaudí’s work. The building has been under construction since 1882. It is scheduled for completion in 2026, one-hundred years from the death of its original architect, Antonio Gaudí (1852-1926). Gaudí designed this irregular oval church and crypt in 1898 and finished its construction in 1914.